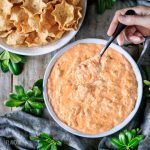 Buffalo chicken dip is a super easy, crowd pleasing appetizer that’s perfect for game night, Christmas, New Years, or anytime you’re having a party! 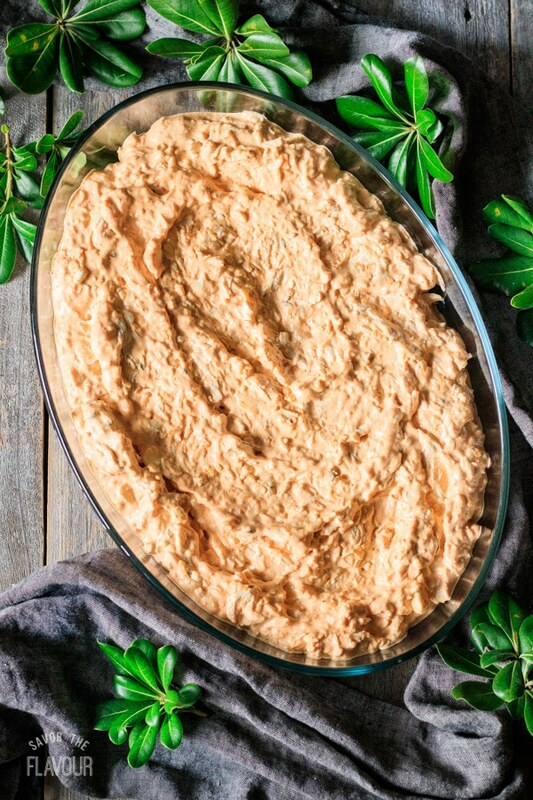 This dip can be baked or made in a crockpot. 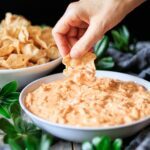 The football fans at your house will love this spicy, creamy snack for the Super Bowl! 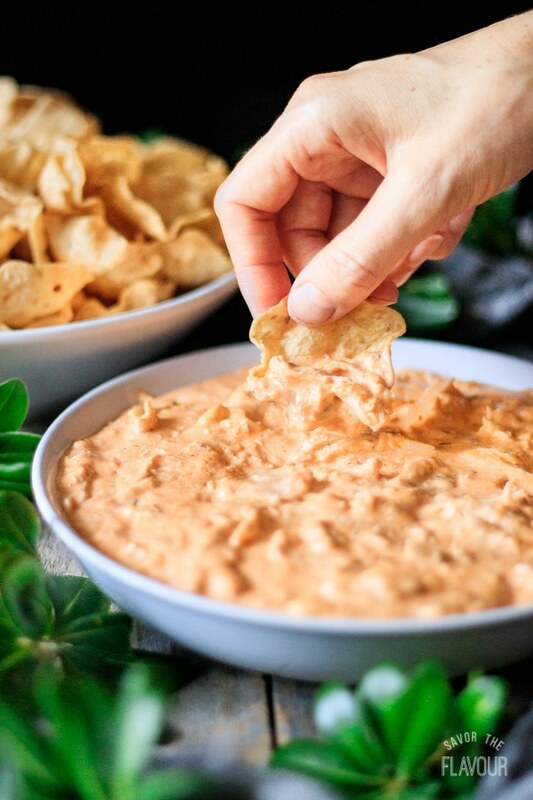 Cheesy, creamy, little bit of spicy…this buffalo chicken dip is one of the best football food snacks ever. It’s a 5-ingredient dip that takes just minutes to make. You can make it in the crockpot or the oven, and even freeze it for later. 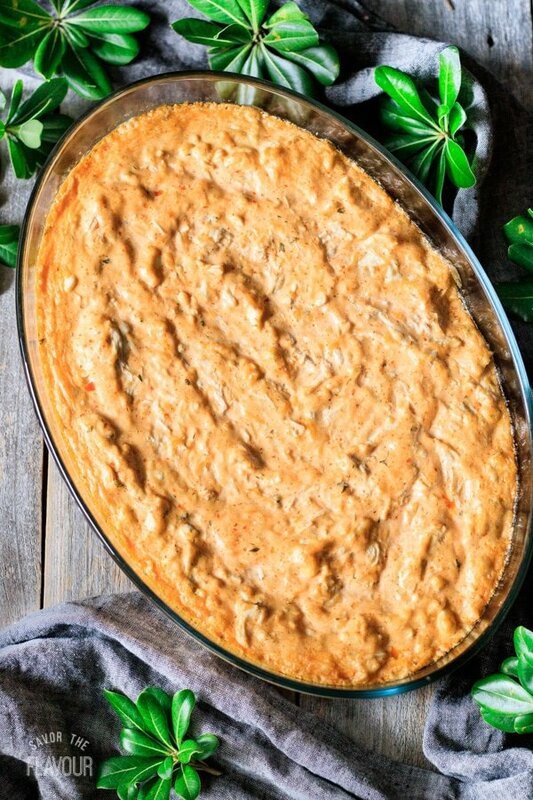 You’ll be the superhero of the Super Bowl party with this buffalo chicken dip! Buffalo sauce is made from hot sauce, butter, garlic, and spices. It’s named after Buffalo, New York, where this sauce was used to make the first buffalo wings back in 1964. Gather the ingredients: shredded chicken, ranch dressing, buffalo sauce, cheddar cheese, and cream cheese. Beat the softened cream cheese with a spoon until smooth. Add the ranch dressing and buffalo sauce to the cream cheese. Don’t worry if there are some lumps; they’ll melt later when the dip is warmed. Mix in the cheddar cheese and shredded chicken until evenly mixed. Spread in a casserole dish or put in a crockpot. Bake at 350 F for 20 minutes or put the crockpot on low for 1-2 hours. The dip should be warm, and all the cheese should be melted. 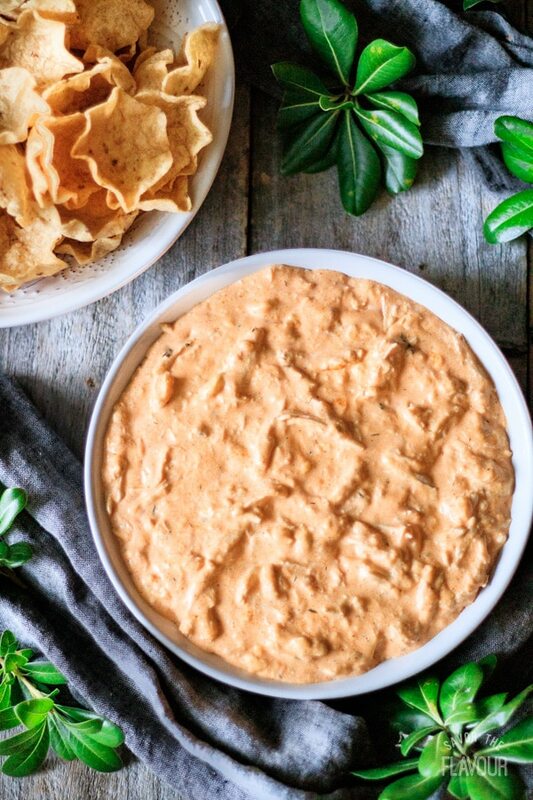 Yes, you can freeze buffalo chicken dip before or after it’s cooked. Place it in an airtight container or zip-top freezer bag and freeze for up to 3 months. Defrost it overnight in the fridge, then reheat the next day in the oven or crockpot. Chicken: instead of poached chicken breasts, use canned chicken or rotisserie chicken. You can even use leftover turkey instead! Ranch Dressing: try sour cream, Greek yogurt, or blue cheese salad dressing. Cheddar Cheese: blue cheese crumbles or grated Monterey Jack cheese. Soften the cream cheese by letting it sit on the counter for an hour before using. Alternatively, remove the cream cheese from its foil wrap and microwave at 15 second intervals until softened. This dip tastes much less spicy after it’s cooked. Adjust the seasonings (i.e. add more hot sauce if desired) after it’s baked. Make this recipe a little healthier by using reduced-fat cream cheese and cheddar cheese. Add more heat to this recipe with hot sauce, cayenne pepper, diced jalapeños, or crushed red pepper flakes. Make this dip vegetarian by using chickpeas or roasted cauliflower instead of chicken. Reheat individual portions of the dip in the microwave for 30 seconds. Be the MVP of the Super Bowl party with these crowd-pleasing appetizers. Easy Baked Jalapeño Poppers: a low carb appetizer with all the creaminess and spiciness you crave. Easy Southern Cheese Straws: these crispy straws are made with real cheese and just right for dipping. Homemade Southern Pimento Cheese: dip soft pretzel buns into this cheesy dip, and you’ll be in heaven. 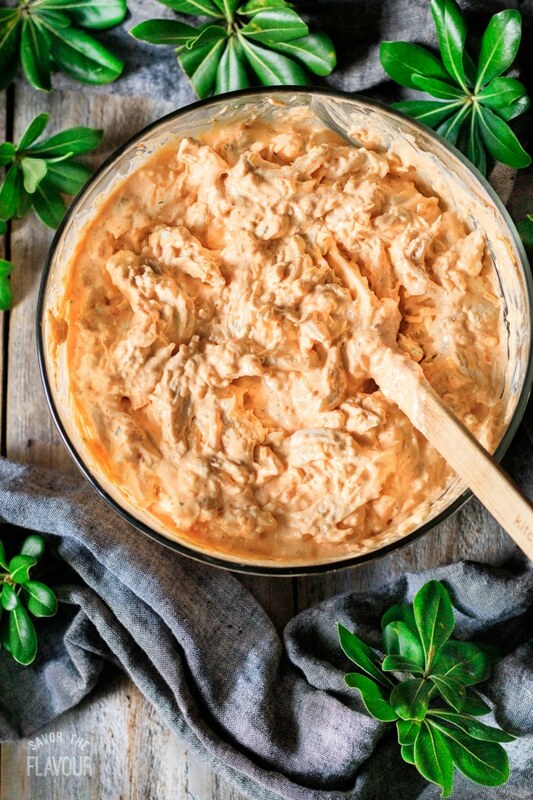 Did you make this buffalo chicken dip? Please leave a recipe rating below to share how you enjoyed it. Stir the cream cheese until smooth, then mix in the ranch dressing and buffalo sauce. Dump in the grated cheese and shredded chicken and stir until evenly mixed. Crockpot: place the dip in a 5-quart slow cooker, cover, and keep on low for 1-2 hours, until warm and melted. Oven: spread the dip in a casserole dish and bake at 350 F for 20 minutes, until bubbling around the edges. Stir the dip, then serve warm with tortilla chips, crackers, or celery sticks. This recipe is mild on the spicy scale, but feel free to add hot sauce, cayenne pepper, diced jalapenos, or crushed red pepper flakes to make it hotter. 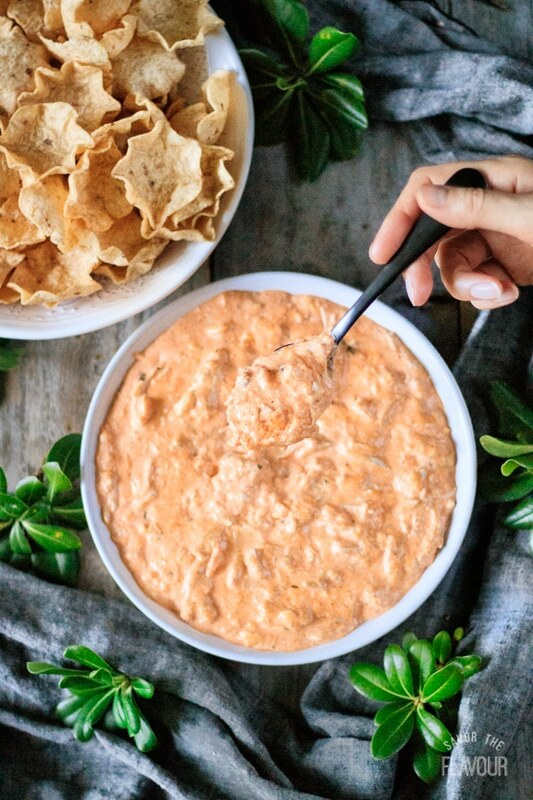 If you’re making this dip for a party, serve it in a crockpot set to warm. 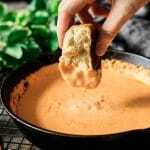 Buffalo Sauce Recipe: in a small saucepan, place 1/2 cup butter, 1 teaspoon minced garlic, 2/3 cup cayenne pepper hot sauce, 1/4 teaspoon salt, 1/2 teaspoon onion powder, 1/4 teaspoon Worcestershire sauce, 1/2 teaspoon granulated sugar, and 2 teaspoons distilled white vinegar. Stir together over medium heat until the butter has melted and the mixture is simmering. Let cool before using. Refrigerate leftovers. 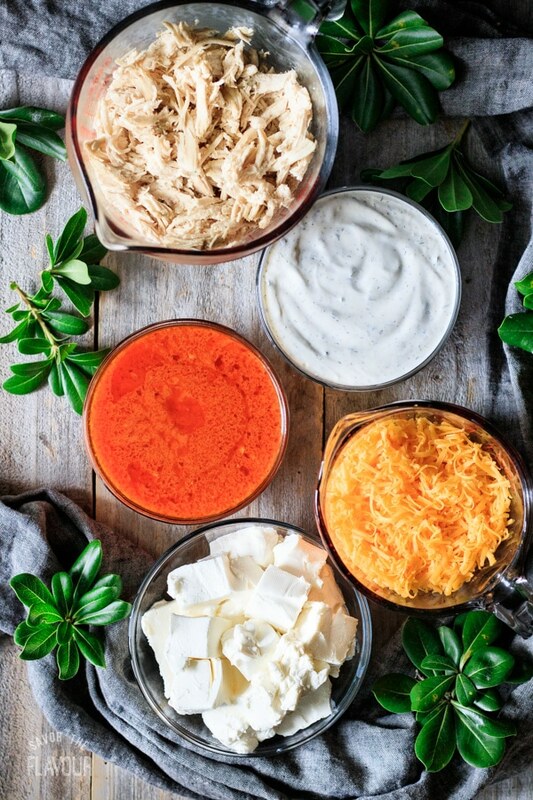 Ranch Dressing Recipe: mix together 3/4 cup Duke’s mayo, 1/2 cup sour cream, 1 tablespoon freshly squeezed lemon juice, 1 teaspoon minced garlic, 1 teaspoon dried parsley, 1/2 teaspoon dried dill, 1/2 teaspoon onion powder, 1/4 teaspoon salt, and 1/4 teaspoon white pepper. If the dressing is too thick, add about 2 tablespoons of buttermilk. This dip is VERY good! Easy to make and a big hit with everyone! I put this in my cookbook and will definitely make again!